A newly released poll found that 66 percent of Taiwanese people feel ties with Japan have “deepened” since the March 11 disaster. An investigation by officials in Saitama uncovered 1,257 cases of welfare fraud in 2011, worth a total of ¥610 million. Welcome to the Stars Hollow Health and Fitness News weekly diary. It will publish on Saturday afternoon and be open for discussion about health related issues including diet, exercise, health and health care issues, as well as, tips on what you can do when there is a medical emergency. Also an opportunity to share and exchange your favorite healthy recipes. You can now find past Health and Fitness News diaries here and on the right hand side of the Front Page. Lately I’ve been buying Persian cucumbers more than any others. I like the small size, the absence of big seeds and the thin skin. I also love the locally grown Japanese cukes I’m buying at the farmers’ market. At other times of year I settle for the hothouse European variety, but they can’t compare with what you can get right now at your farmers’ market. 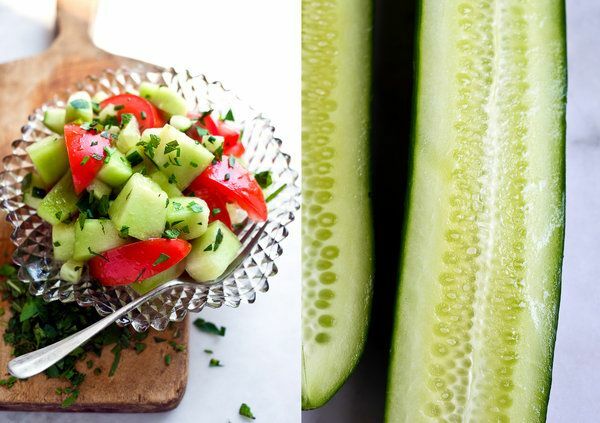 Seek out unwaxed cucumbers so you won’t need to peel them and can benefit from their skin, a rich source of fiber and a good source of potassium and magnesium. Melon and cucumber go well together in this refreshing combination; they’re closely related botanically. This can be spicy or not, depending on what you are serving it with and your taste for heat. I love this tabbouleh-like mixture because of all the herbs and refreshing flavors, and also because of the nice contrast in textures. This is so refreshing that I like to pour it into a glass and drink it as I would a lassi. What distinguishes this summer salad are all the fresh herbs and the sumac and red pepper used to season it. You can buy these spices at Middle Eastern markets or from online retailers like Penzey’s. SO far 2012 is on pace to be the hottest year on record. But does this mean that we’ve reached a threshold – a tipping point that signals a climate disaster? Mr. Scheffer and other scientists are now trying to identify the early-warning signals for climate that precede abrupt transitions. Tim Lenton, a climate scientist at the University of Exeter in England, has identified a handful of climate systems that could reach tipping points in the not-too-distant future. These are not so much related to global average temperatures – the main metric for climate-change arguments – as they are to patterns of climate that repeat themselves each year. I was recently alerted to a remarkably stupid attack (and I use that term advisedly) directed at me from the Council on Foreign Relations on the subject of Iceland. The C.F.R. people take me to task in a blog post titled ” ‘Iceland’s Post-Crisis Miracle’ Revisited” for measuring economic performance in Iceland and the Baltics relative to the pre-crisis peak, which they suggest is some kind of scam. Why not measure relative to the post-crisis trough, under which the Baltics look better? Oh, boy. Economists have been studying business cycles for something like 90 years, and done comparisons to previous peaks all that time; apparently these guys don’t know about any of that. So let’s try this slowly. Gun-rights groups have progressively weakened gun laws in Colorado and beyond, and the White House appears uninterested in fighting back. The usual suspects raked Bloomberg over the coals for “politicizing” the shootings, which is nonsense. When there are plane crashes, we talk about flight safety. When there are wildfires, we talk about fire prevention. Terrorist attacks beget huge (often over-reactive) conversations about security measures. So when one person is able to shoot seventy-one people in rapid succession before police arrive, it’s sensible to talk about whether it should be so easy. Guns aren’t exclusively to blame for the tragedy, but they sure did help make it possible, and multiply the destruction. It would be easy to miss. Midway through an otherwise worthy report on debates over manufacturing within the White House, a brief but troubling blemish: unexamined, un-rebutted spin. “Romney and Republicans,” wrote the Washington Post, “say there is already an example of Obama’s manufacturing program at work-the ‘green jobs’ program that benefited political donors and lobbyists, such as the backers of the failed solar energy company Solyndra.” A Martian reading the article would come away imagining that Solyndra was a Grade A scandal, and “green jobs” itself was a discredited hoax. Unfortunately, by now the average US news consumer may have that impression too. And Republicans are counting on it. Reeling from the controversy over his “retroactive” Bain resignation, this week Mitt Romney is mounting a counter-attack. Rather than his own vulture capitalist credentials, Romney wants to talk about the supposed “crony capitalism” of the president, with Solyndra as Exhibit A. Yesterday, the campaign debuted a new ad warning that, “Obama is giving taxpayer dollars to big donors and then watching them lose it.” GOP Senator Ron Johnson went further, comparing green energy investment to Soviet communism, “the lessons of the Soviet Union.” In December, the conservative writer Conn Carroll posited that this election will be about “Bain vs Solyndra.” Wishful thinking? Too soon to tell. Citing deficit woes, at least six Republican governors say they won’t expand Medicaid. But closing tax breaks and loopholes for the wealthy would more than pay for the expansion. Texas has the highest rate of uninsured residents in the country (25 percent), and it stands to enroll some 1.8 million new Medicaid recipients through the expansion. These are some of the poorest people in America, making less than 133 percent of the federal poverty level (just $31,000 a year for a family of four). In the first six years of the expansion, from 2014 to 2019, the total cost of insuring these Texans would be about $55 billion-not an inconsiderable sum. But the federal government would pay more than 95 percent of that amount; Texas’s share would be just $2.6 billion. That’s not chump change-but threaten Texas with financial ruin? Not by a long shot. – Londoners were practicing his kind of crony capitalism. Even before the Bain capitalist knew that bankers in London were lying to regulators and fixing interest rates in order to run up their profits-engaging in activities that the governor of the Bank of England said “meet my definition of fraud”-Romney was excited about getting a piece of the London bankster action. But Romney campaign has has gone to Olympian lengths to make their candidate’s British sojourn seem to be about something other than the looting of London. The Republican presidential contender’s international fundraising operation-and, yes, he does have an international fundraising operation-scheduled two major events to coincide with the opening of the Olympic Games. As a candidate who is having trouble touting his business experience (Bain Vulture Capital) and his governing experience (RomneyCare), the presumptive Republican presidential nominee calculated that it might be a good idea to take a trip across the pond to highlight his (somewhat less controversial) management of the 2002 Winter Olympics in Salt Lake City. As regulators and law enforcement officials around the world begin to dig into the Libor scandal, the 15 or so banks who know they’re responsible for the massive rate-rigging are trying to limit the damage. That’s right, it’s time for another round of: let’s have a global settlement! Reuters did add that regulators would like the idea of a global settlement because they would get to have a big press conference and announce a headline number, and I think that’s right. We saw the appeal of that in the foreclosure fraud settlement. Dudes, we gave you a link last week from Sky News saying the same thing! A group agreement would appeal to financial watchdogs because they would be able to announce a headline-grabbing figure, showing that they were dealing firmly with the banking industry’s misdemeanors, a banker told Reuters on condition of anonymity. Earlier this year, five top U.S. banks negotiated a $25 billion settlement with the U.S. Justice Department and other federal and state agencies to resolve allegations of mortgage services abuses. However, if they were able to reach a group settlement it would enable them to share the pain of negative publicity. Analysts have estimated that the scandal could cost the industry between $20 billion to $40 billion, further damaging a sector that is struggling to work its way through the aftermath of the 2007-2009 financial crisis, economic downturns in Europe and the United States, and increased regulatory demands. Investors believe that an industry-wide settlement will be necessary if other banks are to avoid a clear-out of their top executives, although one mitigating factor which might assist those who get fined for Libor-rigging is likely to be the fact that many of them have changed their top management since the periods under investigation. “A drip-feed of Libor-related fines would be hugely damaging to investors with large exposures to international banks,” one leading shareholder told me. Of course, it’s the view of many that banks which are found guilty of such an important offence as manipulating the rate of Libor should sack those responsible and that they should face further punishment under the law. July 21 is the 202nd day of the year (203rd in leap years) in the Gregorian calendar. There are 163 days remaining until the end of the year. On this day in 1861, the first battle of Bull Run.. In the first major land battle of the Civil War, a large Union force under General Irvin McDowell is routed by a Confederate army under General Pierre G.T. Beauregard. . . .
Bull Run was the largest and bloodiest battle in American history up to that point. Union casualties were 460 killed, 1,124 wounded, and 1,312 missing or captured; Confederate casualties were 387 killed, 1,582 wounded, and 13 missing. Among the latter was Col. Francis S. Bartow, who was the first Confederate brigade commander to be killed in the Civil War. General Bee was mortally wounded and died the following day. Union forces and civilians alike feared that Confederate forces would advance on Washington, D.C., with very little standing in their way. On July 24, Prof. Thaddeus S. C. Lowe ascended in the balloon Enterprise to observe the Confederates moving in and about Manassas Junction and Fairfax. He saw no evidence of massing Rebel forces, but was forced to land in Confederate territory. It was overnight before he was rescued and could report to headquarters. He reported that his observations “restored confidence” to the Union commanders. The Northern public was shocked at the unexpected defeat of their army when an easy victory had been widely anticipated. Both sides quickly came to realize the war would be longer and more brutal than they had imagined. On July 22 President Lincoln signed a bill that provided for the enlistment of another 500,000 men for up to three years of service. The reaction in the Confederacy was more muted. There was little public celebration as the Southerners realized that despite their victory, the greater battles that would inevitably come would mean greater losses for their side as well. Beauregard was considered the hero of the battle and was promoted that day by President Davis to full general in the Confederate Army. Stonewall Jackson, arguably the most important tactical contributor to the victory, received no special recognition, but would later achieve glory for his 1862 Valley Campaign. Irvin McDowell bore the brunt of the blame for the Union defeat and was soon replaced by Maj. Gen. George B. McClellan, who was named general-in-chief of all the Union armies. McDowell was also present to bear significant blame for the defeat of Maj. Gen. John Pope’s Army of Virginia by Gen. Robert E. Lee’s Army of Northern Virginia thirteen months later, at the Second Battle of Bull Run. Patterson was also removed from command. Thank goodness this is the last tape delayed broad cast on Faux this season because it’s just impossible to keep up with the point paying positions without using Speed Racecast and that is live though there is some update lag. Then you have to watch it to sync them up. These are the same tricks I used for Valencia and Silverstone. The good news is that it’s not quite as damp as Silverstone was. In the morning Practice the weather wasn’t so bad and they were able to turn some laps on the Softs. It rained all afternoon and the only tires that would work were the Inters. This is kind of a problem because lots of teams have mid-season aero replacements that have never been tried. Did I mention mid season? Yup, race 10 of 20 followed next week by Hungary and then Formula One takes August off entirely. If the race is run on dry tires the choices on offer are Mediums and Softs. Hockenheim is known for a lot of brake and tire wear because of its high speed straights and tight corners. Kobayashi was fined 25k euros for hitting 3 crewmen at Silverstone. Maldonado received a 10k euro fine for wacking Perez. The last Time Trial. The last stage before tomorrow’s Champs-Élysées parade. I don’t know about you, but I get all nostalgic and sentimental at the end of events like this. This is the only 99th Le Tour there will ever be. That said, I’ll also be covering Hockenheim, which will conflict today but not tomorrow since the parade will be live on Vs. (NBC Sports) at 8 am and I’ll do it it while taking lap notes. It seems the sporting news is coming fast and furious with The Stars Hollow Gazette Olympic coverage starting Wednesday (Women’s Soccer). We’ll be providing schedules and results and may live blog some of the more obscure events (Fencing, Team Handball). It’s not Curling, but what can match the excitement and majesty of sliding around big rocks on ice? Despite their apparent obscurity there are reasons I indulge myself in the diversion of sports. For one thing the defined time element, things are over when they are. There is no argument about the score, though the officiating may be questionable. Their study provides insights into other things AND they have the benefit of novelty. When you sit down you have no idea how things will turn out. Keep in mind that according to his form in the 2 previous Individual Time Trials Wiggins is expected to gain 5 minutes on this course which is essentially flat. Coverage is customarily on Vs. (NBC Sports) starting at 8 am with repeats at noon, 2:30 pm, 8 pm, and midnight. There will be some streaming evidently, but not all of it is free.